This old jail is truly amazing. It is located in Hallettsville Texas. It was started in 1884 and finished in 1886 where originally the D.W. Merritt home was. This building served as the county jail from 1886 until 2005 making it the second longest continuously running prison. The history of deaths in the prison is very limited. One of the strangest deaths that has occurred here involved GREGORY RAY HIGHTS, He was convicted of shooting his wife in the head while she was at work in the neighboring town of Yoakum. He was sentenced to 99 years and was being held on suicide watch at the jail, during this brief stay his two cell mates supposedly alerted the guards. They found Gregory Ray Heights dead hanging from a sheet that was tied to the showers crossbar. You do not have bed sheets if you are on suicide watch. You die a very slow and violent death from this particular type of hanging as there is no way to break the neck. Being that he had cell mates in a one person cell there would be no way for this man to have died so quickly. It looks as if a little prison justice may have occurred. It has never been proved or disproved. In 2014 Rita, Inc. purchased the jail with plans to reveal the original building façade through restoration work. Luckily for us Debra and John have been able to manage it for now and allow professional paranormal investigators a chance at investigating a very active location. They have it set up perfectly. Two working bathrooms and a break and sleeping room. They have coolers, little fridge, microwave, crockpot, griddle and a coffee maker. They have also provided four twin air mattresses with all the linens as well. One of the most professional operations going and you get the awesome company of Debra and John when ever you want. We chose the two night deal. With all the investigations we have done we have found that two is always better than one​. The energy level is always better the next night. Upon arriving at the jail we are greeted by Debra and John. We go inside and the tour begins along with the known history of the jail. After this we sit around for about an hour just talking to them about different places we have all been and different experiences we have had. The first experience's happen rather quickly. Coming back down from the upstairs jail I was poked in the side rather firmly. Jose heard a child's voice. Angela had her hair pulled and we haven't even got our equipment out of the car yet. The first night was mainly photos and EVP sessions. There were a lot of personal experiences on both nights. The second night had the most activity. 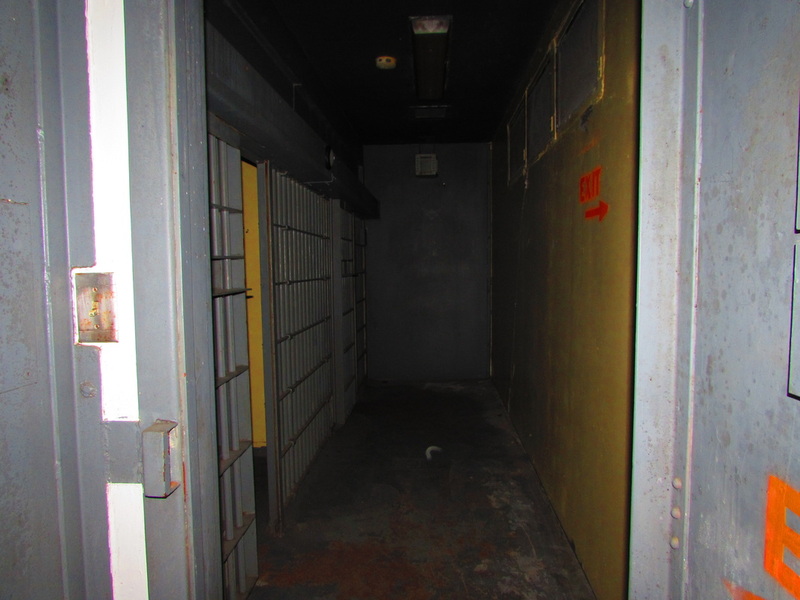 Jason and Angela were in the downstairs male cells recording while another group were doing a EVP session in the female cells. While sitting in dead silence two footsteps echo only feet away and then the end of the hall completely goes black and three more footsteps are heard. then everything fades away. Other experiences include banging on cell doors, whispers into the ears and footsteps. All in all it was a super active two days. Day or night, the activity seems to be nonstop. With the amount of EVPs that we are capturing, it will be a work in progress uploading them all. This anomaly appeared on the second photo taken of the cells.